Hi Guys, at present time most of the person must have to use Android smartphone of different companies. When you bring any latest technology Android smartphone you have lot of excitement about the features of your Android smartphone. Most of the Android phone uses need to secure his Android phone and they have to use third party software. But today we will discuss an important tips to use screen pinning feature in Android Lollipop. If you have an Android Lollipop smartphone and want to use the facility to easily lock or pin the screen of Android Lollipop. This app is temporarily locked your screen and don’t allows anyone to access other apps on your Android Lollipop. If you don’t like to give your phone to your friends due to watching your personal photos, messages then you can easily lock your screen with the help of screen pinning feature in Android Lollipop. You can also use this feature to stop your kids or any other person to play any games on your phone. This features is available only latest version by the name of screen pinning feature in Android Lollipop. It is very useful and important feature of your Android Lollipop. Step 1: If you want to enable screen pinning then tap on the “Settings” on your Android Lollipop. Step 2: Tap on the “Security” option in the “Settings” windows. Step 3: Turn on Screen pinning feature in Android Lollipop. Step 4: After turn on screen pinning feature open the screen which you want to pin or lock. Step 5: Touch the “Overview”” button on your Android Lollipop. Now, scroll down the screen and touch on the pin icon on your Android Lollipop. This will shows you an dialog box, tap on the “Start” button. This will shows an messages on your Android Lollipop “Screen pinned”. Now, you will not be able to move the window. Step 6: If you want to unpin the screen touch and hold the “Overview”” button on your Android Lollipop. This will shows you “Screen unpinned” on your Android screen. I hope you like this article. After reading this article you will be able to know easy trick to use screen pinning feature in Android Lollipop. 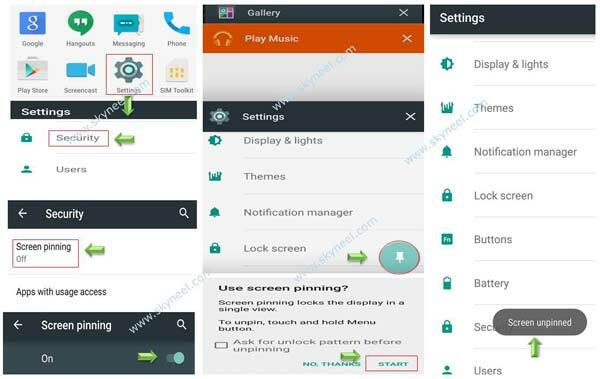 These trick will be helpful for all Android and Lollipop lovers who want to lock or pin your Android Lollipop screen. Kindly share your knowledge with your friends, family members and others and give important suggestions in the comment box. Thanks to all. How to create a Facebook Page? How to logout a Gmail account?